Am I The Only One Who Does Not Like Uggs? Discussion in 'Shoes, Shoes, Shoes' started by klassy, Nov 25, 2003. I see these boots in all the stores and I just want to rip them off the shelves. I wonder why UGGs have so much admirer????? Like Leyla said in another thread, I'd wear them for comfort. Only if it was really cold and snowy, because they really don't look good to me. If you want warm, waterproof boot for winter that look better than Uggs (and more choices) try the Canadian-made boots by Santana. 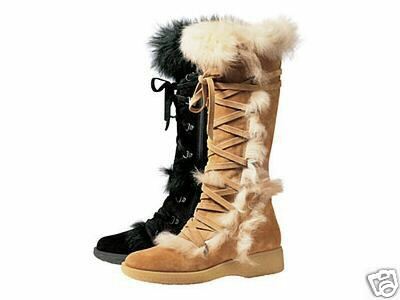 Very comfortable and perfect for winter. Don't like them either ! But the boot. I just can't handle the boot. They look convenient for cold weather but not very stylish...How about the Coach Andi boots? I think I like them better. Seems more stylish and also suits the purpose well (warm,cozy toes ) Ridiculously priced at ebay though! can we pelas keep the ugg posts to a minimum, we already have one pleas dount post more.